All of our preschool classrooms have earned 5 STARS in the the Step Up To Quality System! 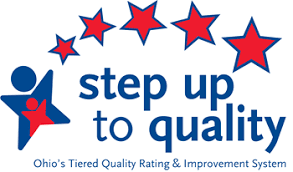 Step Up To Quality (SUTQ) is a five-star quality rating and improvement system administered by the Ohio Department of Education and the Ohio Department of Job and Family Services. SUTQ recognizes and promotes learning and development programs that meet quality program standards that exceed licensing health and safety regulations. The program standards are based on national research identifying standards which lead to improved outcomes for children. Registration packets for next school year are available at our Board Office now. However, the completed packets will not be accepted until January 3. Parents who are interested in having their child attend our preschool may pick up a packet now and turn them in in January. Once a packet is completed and returned to us, your child's name will be placed on a list of prospective students for the 2019-20 school year. Current families do not have to re-register but are asked to complete and return the intent form to their child's teacher. Please contact your child's teacher if you did not recieve an intent form. Next year Preschool will operate Monday through Friday in approximately 2 1/2 hour sessions. There will be AM and PM sessions at Cridersville and Wapak Elementary. Class placements will begin by March. However, it is not recommended that you wait until March to register, as our classes fill up quickly. Tuition will be established after the federal government has established the poverty level for 2019. Tuition will be income sensitive and placed on a sliding scale, as in the past. Payment for the first month is not expected until your child has been placed on a class list. Questions regarding preschool can be directed to Carrie Knoch by email at knocca@wapak.org or by phone at 419-739-5064. In case of school delays, AM Preschool will run from 10:00 am - 12:00 pm. PM Preschool will run from 12:30 pm - 2:40 pm.